They're just not out there any more. Sure, there are some Suburu Outbacks (I always type that "Suburb-u") and a few other cars that are kind of a cross between hatchbacks and regular cars, but there aren't the kind of station wagons we grew up with. 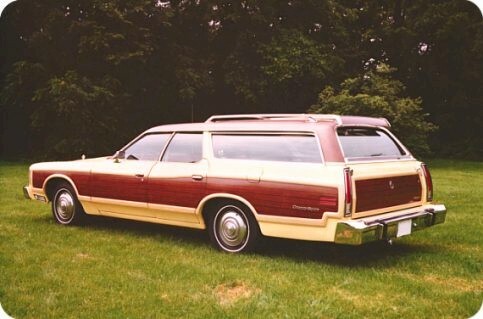 I think my mom had the Ford Country Squire, with the fakey wood paneling strip on it. The Wikipedia entry talks about how the original was a woodie, and then they moved into the fake wood detailing. Clas-say, my family was. Wikipedia says station wagons started to fade with the 70s gas shortages, but I remember them being everywhere that decade. It was really the introduction of the minivans, which Baby Boomers mistakenly felt were cooler than station wagons, that put the final nail in the coffin of station wagons. I always silently cheer when I see one on the road today. Station Wagon.com is a fun trip down memory lane. What station wagon did you ride in? Did you fight to sit in the way back and wave at the drivers on the road behind you? I loved to sit in the way back and watch tonroad slide benarh us. It reminded menof the beginning if Star Wars. Of course, the carbon monoxide deaths in the way back killed them negate why they don't make those any more. And hey, I love my minivan! We have a playstation hooked up so my kids can play on car trips. I was FORCED to sit way in the back of the station wagon, because my older brother and sisters were smart enough to pretend that it made them sick to face the wrong way. I hated not being able to see the correct road signs, especially the ones for South of the Border.